Sit back and grab a cuppa as I have lots to share with you about exactly that! 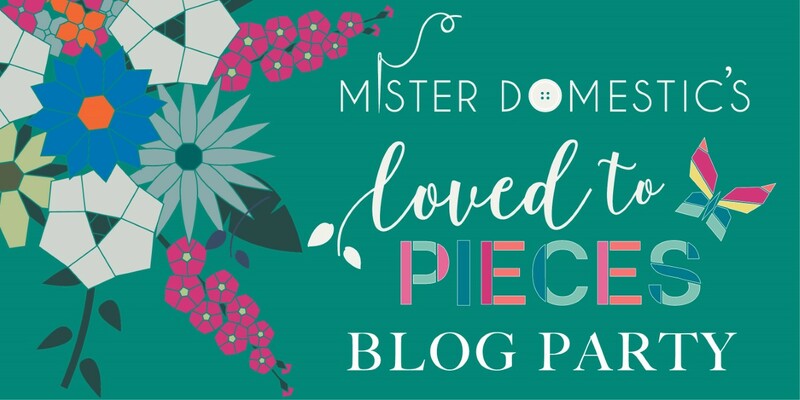 I am excited to be a part of Mister Domestic’s Loved To Pieces Blog Party! Yaaaaaaay!! 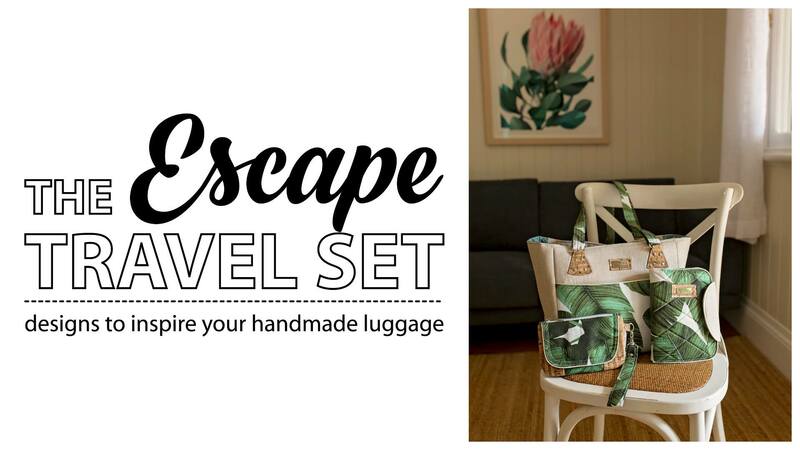 I have had the privilege of creating some projects to share with you from this gorgeous fabric range. 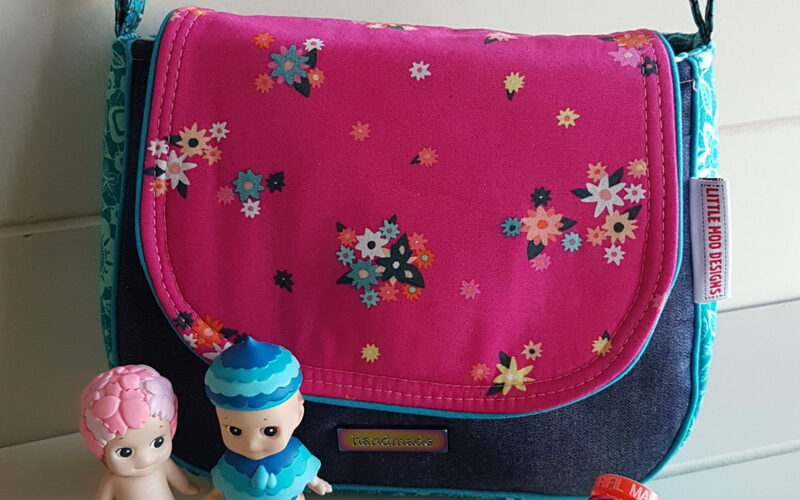 The colours and detail in this fabric makes for so many options when making bags, I had lots of fun mixing and matching to make my designs. This range is printed by Art Gallery Fabrics and as always the quality is second to none, it is very easy to work with and gives a lovely finish. The other exciting product that I got to use for the first time was Aurifil Thread! I have heard Mister Domestic talk about his love of this thread for a long time, however I have never been able to find it locally (my local fabric store Precious Time Fabric & Quilts is now carrying it in ALL the pretty colours if you would like to have a look for yourself). I used the 50 WT thread in various colours from the complimenting thread box which is called ‘Helena’s Toybox.” Oh my gosh the packaging is so adorable and the thread was just beautiful to work with! I am now hooked. Are you ready to check out my projects in this pretty fabric range?? First up I made a Pinky Promise Bag. Mister Domestic has a 4 year old daughter named Helena, I made this sweet bag just for her. 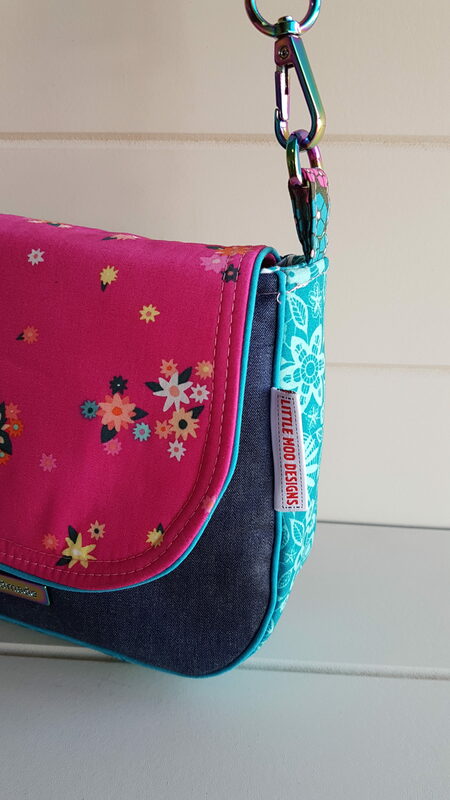 I chose the gorgeous “Efflorescent Fuschsia” for the flap of the bag, teamed with Art Gallery Fabrics Denim for the body pieces. I used teal piping for a pop of colour and pretty rainbow hardware from Who Says Sew. 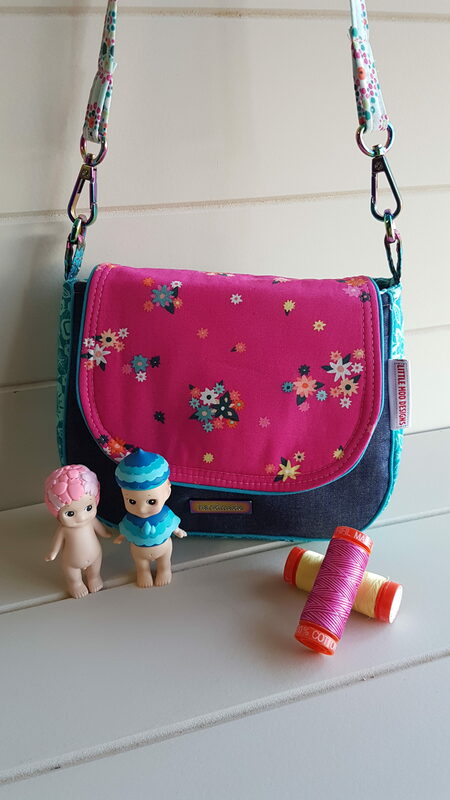 I hope Helena enjoys this pretty bag, it is such a great size to fit all your pretties in. 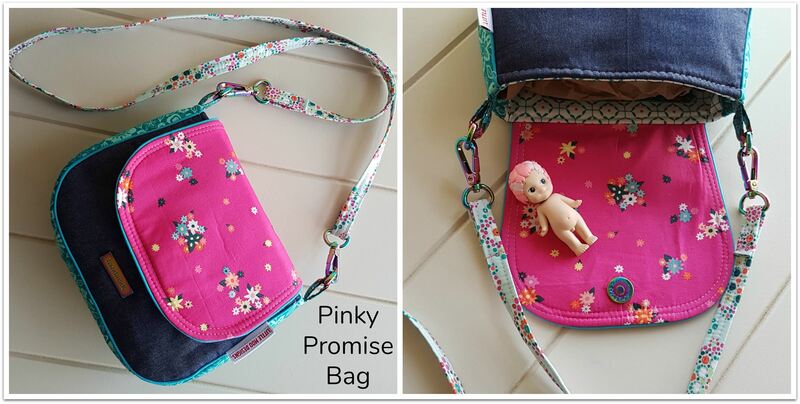 If you would like to make your own Pinky Promise Bag, you can get the pattern here. 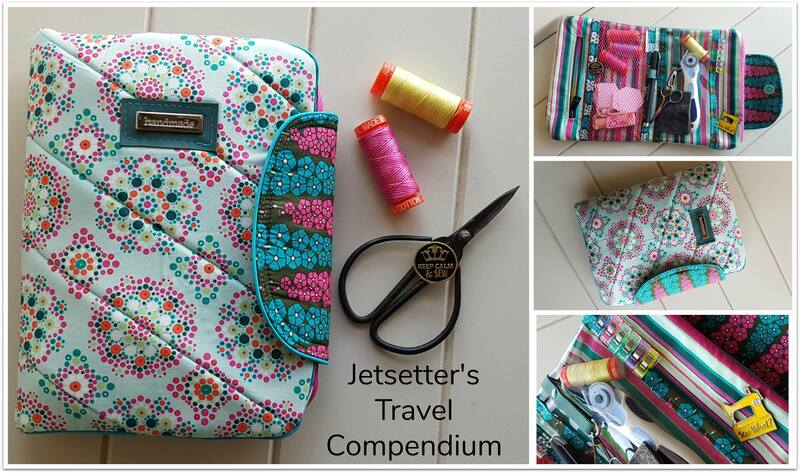 I had so much fun creating with this fabric that I decided to make a Jetsetter’s Travel Compendium with a few little changes to make it a hand sewing kit, for Mister Domestic himself. I wanted a spot to keep Aurifil Thread, needles (see the little needle book! ), small rotary cutter, scissors, hexie papers, wonderclips and more! I just love how this turned out!